After the successful launch of Tata Photon in the postpaid segment, Tata Teleservices Limited (TTML) today announced the availability of Tata Photon Plus, the mobile broadband service, on the Prepaid platform also. 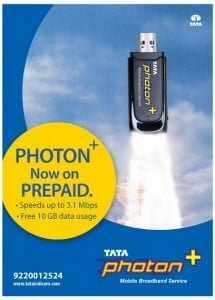 Tata Photon Plus mobile broadband service is 20 times faster than the existing mobile wireless technology and is offered on the congestion–free Tata Indicom network (as reported by the Telecom Regulatory Authority of India (TRAI)).Internet users can now surf the net at these high-speeds with as low as Re. 1/MB and also avail of attractive recharge vouchers that offer up to 10GB free data usage. Speaking on the occasion Raja Srinivas, Sr. Vice-President – Strategy and Special Projects, Tata Teleservices (Maharashtra) Limited said, “As market leaders in the wireless data connectivity space we understand the evolving data needs of the market.We have been receiving phenomenal response to the Tata Photon Plus from the postpaid segment, demonstrating the experience and the overall value we provide. Guys … don’t buy TP+… its worst Customer Service and you can’t judge your bill on end of the month. Could you tell me the prise of Micromax data card( 2G and 3G) price.